Class implementing UDP-based channel to create faces. Definition at line 40 of file udp-channel.hpp. Create a UDP channel on the given localEndpoint. 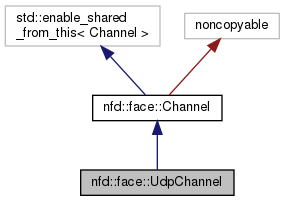 To enable creation of faces upon incoming connections, one needs to explicitly call UdpChannel::listen method. The created socket is bound to localEndpoint. Definition at line 38 of file udp-channel.cpp. Definition at line 55 of file udp-channel.hpp. Definition at line 61 of file udp-channel.hpp. Create a unicast UDP face toward remoteEndpoint. Definition at line 51 of file udp-channel.cpp. Enable listening on the local endpoint, waiting for incoming datagrams, and creating a face when a datagram is received from a new remote host. Faces created in this way will have on-demand persistency. Definition at line 73 of file udp-channel.cpp.